Heading off to sleep away camp for the first time is always exciting for campers, and no matter how old your child is, there is always some anxiety and concern. We recently let our son go to Camp Wesley Woods for 5 nights/6 days… his first time spending more than 2 nights away from home without either me or his father being with him. Camp is great for children because it gives them the chance to explore, test their limits, meet new friends and build some independence. Like trying anything else for the first time though, campers deal with worry and stress over what they will be doing, making friends and not liking their camping experience. Once they get over those first hurdles and start having fun, they will look forward to attending camp every summer. 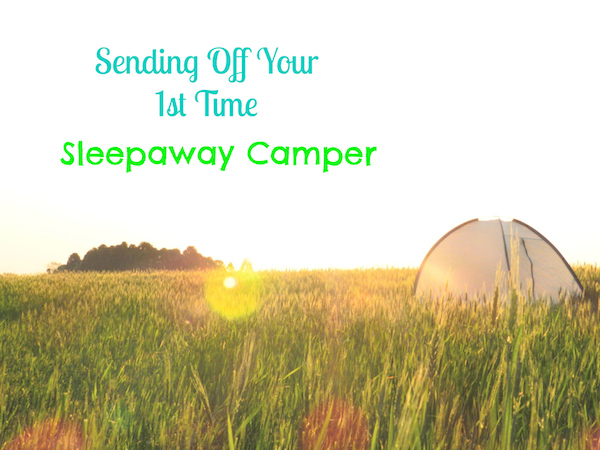 Use these tips to help your first time sleepaway camper work past their nerves over being away from home and look forward to all the fun camp has to offer. Let your camper know that it is okay to be scared and miss home, allowing them the time they need to talk out their feelings and concerns. The sooner you start talking about what concerns them, the sooner you can help them work through it and begin to get them excited about heading off to camp. A lot of first time overnight campers are actually also first time overnighters in general. To help your child ease some of the anxiety they are feeling about staying overnight away from home, set up a couple overnight stays where they feel safe. Talk to family and close friends about helping host a fun overnight with your camper. This gives children the chance to spend the night away in a fun and safe environment, and a positive attitude about doing it again in a few weeks when camp arrives. One of the best parts of camp, for both parents and campers, is getting something in the mail from a loved one. While camps like to allow parents and kids the chance to stay in contact during their stay, it is best if that contact is kept to a minimum. Talk about writing letters and let your camper put together a stationary kit complete with addressed and stamped envelopes. While your camper is prepping their kit, put together a goody box full of their favorite snacks and treats that you can send off as soon as your camper heads off so that it makes it there midway through their stay. At Camp Wesley Woods we were able to send emails daily to Cody that were printed out and given to him to read. Other than that, that was the only contact we had with him. Trust me, this was much tougher on us than it was him. They did take pictures throughout the day and post them after 10 pm each night — we could not wait to look through them to see any photos of our son. Camp is unpredictable, like everything else, but when your camper is away they might have to be ready to deal with some of those situations by themselves. Go over any what ifs your child may have and help them think up solutions for specific problems. Do what you can to help them prepare themselves, for example, pack an extra pair of shoes or socks in case theirs get wet. Have your child help pack and label all their belongings so they know what is theirs and what to look for when something comes up missing. Something as simple as a hand powered flashlight can be enough to ease a lot of concerns of your camper. Have your kids tried sleep away camp yet? Some of my favorite childhood memories were at camp. I absolutely loved the experience, and can’t wait for my children to experience it also. Thanks for the tips! Mt did his first sleep away camp this summer. Then a week later flew to Indian by himself! He’s getting some real experiences this summer for sure! Great tips! Thank you so much for sharing them.